Make your kitchen the heart of your home with Dream Doors Stoke. Speak to our designers and view our stunning collection at your local kitchen showroom in Stoke-on-Trent, Staffordshire. Speak to our kitchen design team at your local Dream Doors Stoke kitchen showroom to plan and create a stunning bespoke kitchen for your home. Based in Stoke on Trent, you can find kitchen ideas to suit every taste and speak with our local experts who can help you customise your ideal design. Our Stoke showroom, owned by Allan and Glyn, serves Stoke and all neighbouring ST postcodes including Stafford, and they will be happy to discuss your requirements and help you create your perfect kitchen. Allan and Glyn can show you the wide variety of options available to you including our classic, traditional, modern and contemporary designs. As well as our online kitchen design tool, you can also schedule a consultation with Allan or Glyn, who can come to view your existing kitchen space and provide a no obligation quote based on your ideas. This is a practical solution should you need some first-hand expertise and ensures our design team can get to grips with your project quickly and efficiently. 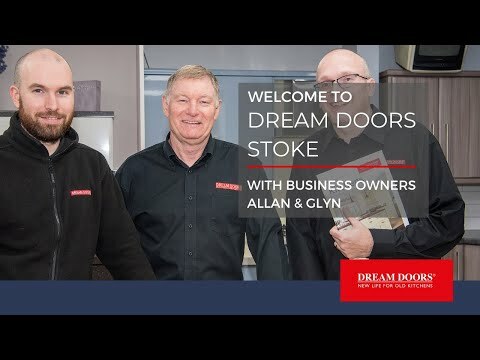 Dream Doors Stoke-on-Trent serve Stoke and all local ST postcode areas. This includes Leek, Kidsgrove, Alsager, Stafford, Cheadle, Uttoxeter, Market Drayton, Newport, Oswestry, Penkridge, Kidsgrove, Chesterton, Keele, Stoke Heath, Shawbury, Telford, Stone, Whitchurch, Penkridge, Shrewsbury, Longton, Tunstall, Talke, Newcastle, Clayton, Hanley, Birches Head, Trentham, Fenton, Blythe Bridge, Meir Heath and all local Staffordshire UK areas. "Good customer service in the shop. There was no pressure to buy, but very helpful with information on the products." "Excellent work done to a very high standard in what was limited space. Would recommend Dream Doors to family and friends." “From start to finish we were treated really well by this lovely family-friendly team. No pressure to buy, everything explained and a small problem was sorted quickly." "Excellent service, very polite. We now have a nice new kitchen." "It was completed exactly in the time forecast. Some small additional work was carried out without charge. Workforce were polite, considerate, highly skilled and very hard working"
"Thrilled with the service from the minute we went to the shop right until the job was completed."